Foreign aid from the four original BRIC countries (Brazil, Russia, India and China) more than doubled from 2005 to 2008, according to the organization Global Humanitarian Assistance. During that period, China’s foreign assistance grew by more than 30 percent annually. India, the largest foreign aid recipient in history, is actively looking to establish a national aid program akin to USAID or the U.K.’s Department for International Development (DFID), according to a recent Economist article. China’s very official-sounding Information Office of the State Council issued the country’s first white paper on foreign aid in April of this year. China’s concerted efforts to ramp up its foreign aid marks a noteworthy shift in the country’s involvement with foreign assistance programs. As recently as six years ago in 2005, the World Food Programme discontinued 25 years of continuous food assistance to China. The U.K.’s DFID shuttered its foreign aid program in China just this year. Despite China’s prominent role as a long-time recipient of foreign aid, the white paper asserts that China’s position as a foreign aid donor has been several decades in the making. After initially targeting North Korea and Vietnam, China reportedly expanded its foreign aid program to African countries as far back as 1956. The lack of detail about the origins of China’s African aid could raise questions about the materiality and motives of this history, though that line of investigation is beyond the scope of this article. The white paper refers to 2004 as a pivotal year in China’s foreign aid efforts, with the national aid budget growing nearly 30 percent annually between 2004 and 2009. 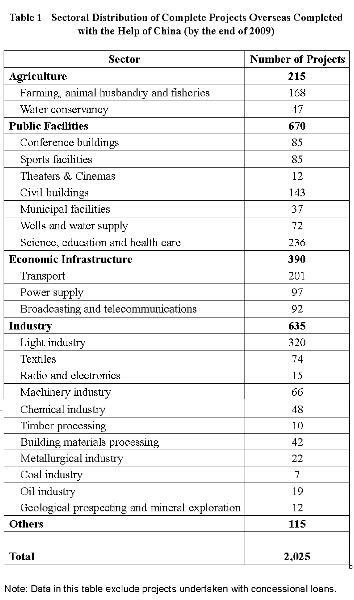 During this period, the Chinese government endeavored to, “strengthen foreign aid in the fields of agriculture, infrastructure, education, health care, human resources, and clean energy.” The table below shows the sectoral distribution of China’s foreign aid projects through the end of 2009. China’s foreign aid financing takes the form of grants, interest free loans and concessional loans. 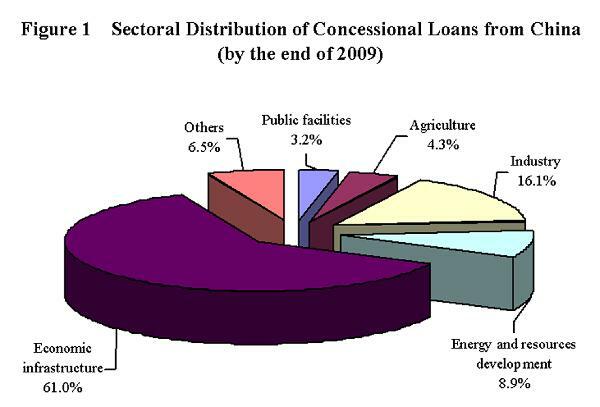 The chart below shows the sectoral distribution of China’s concessional loans through the end of 2009. China’s foreign aid program “entered a new stage” in August, 2010 when the Chinese government convened the National Conference on Foreign Aid. As the largest foreign aid recipient in history, India took in $55 billion in foreign aid between 1951 and 1992 according to the Economist. In this context, the mere fact that India is seriously entertaining the idea of establishing a national development program is a clear testament to the extent of the country’s economic progress. An Economist source maintains that India’s government will announce the Indian Agency for Partnership in Development (IAPD) within months. This source is apparently well-informed enough to suggest that the IAPD will have $11.3 billion to spend over the next five to seven years. Not just a work in progress, India’s foreign aid efforts have already yielded positive results. India’s huge investments in hydropower in Bhutan in exchange for electricity have helped both countries in the Economist’s assessment. Other Indian foreign aid initiatives include similar power investments in Nepal, post-war reconstruction in Sri Lanka and infrastructure development in Afghanistan, where India is the fifth largest donor of foreign aid. Brazil “is fast becoming one of the world’s biggest providers of help to poor countries” according to an earlier 2010 article from the Economist. The authors estimated the total value of Brazil’s development aid could already reach $4 billion per year, though they labeled this figure as “broadly defined” development aid, cautioning about comparability with data for other countries. A more recent article reaffirms that reliable aid data for “new donors,” including China, can be hard to come by. Relative to China and other countries, Brazil’s brand of foreign aid tends to emphasize social programs and agriculture. Both are areas in which the country has had its share of successes and could be regarded as having a comparative advantage over other donors. In the African country of Mali, Embrapa, Brazil’s highly accomplished, public agricultural research organization, has managed to make cotton yields soar at an experimental farm. Incidentally, the potential for Brazil and Embrapa to contribute to a green revolution in Africa seems quite real considering Embrapa’s instrumental role in Brazil’s amazing transformation from a net food importer to one of the world’s leading agricultural exporters. The extent to which the BRIC countries’ foreign aid programs will spur development in recipient countries remains to be seen. There is ample, if often ill-founded skepticism about the extent to which the objectives of these efforts might be largely self-serving. For example, critics often cite the link between foreign aid to Africa and securing rights to the continent’s ample reserves of strategic raw materials. In terms of diplomacy, there should be limits to the value of self-serving initiatives since well-designed foreign aid programs ought to produce benefits that engender genuine goodwill and long-term diplomatic capital. More immediately, there is also plenty of potential for these new aid programs to provide much-needed resources for the development of recipient countries and, in the process, also serve the greater global socio-economic good. While the outcomes of aid programs depend on a number of factors, there is encouraging evidence to suggest that this hopeful scenario is already happening in a number of places.